Biofuel sources hit the road. Then what happens? CFAES scientist Ajay Shah answered the question, “What is the additional cost of road maintenance due to cellulosic feedstock delivery to a biorefinery?” recently in Ohio’s Country Journal. Biorefineries produce biofuels from cellulosic feedstocks like corn stover, shown here. (Photo by Wally Wilhelm, USDA-ARS). 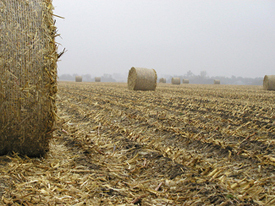 Posted by Kurt Knebusch at 2:01pm Posted in In Business, On The Farm and tagged bioenergy, biofuels, renewable energy. Bookmark the permalink. ← 3:30 talk today: What’s going on in the beekeeping world?